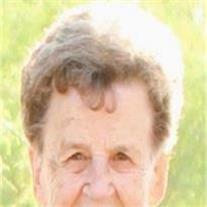 82, of Gilbert, Arizona passed away on December 22, 2012. Born in St Johns, Arizona, she was the beloved wife of Earl McGregor Patterson; mother of 7, Virginia (Larry) Sanders, Don (Leslie) Patterson, Terri (Gerry) Ownby, Greg (Leni) Patterson, Christine (Bradley) McBride, Jeanne (Criss) Padilla; 38 grandchildren, 66 great-grandchildren, and 14 great-great grandchildren.She was preceded in death by her husband Earl, her parents Etta and Henry Ward Heap, daughter JoAnn (Dendy) Grant. She is also survived by one brother, Norman Heap. After teaching school for over 35 years, she served four missions for the Church of Jesus Christ of Latter-day Saints, including the Ukraine, Thailand, and two family history service missions. Services will be held on Friday, December 28, at the Val Vista LDS Stake Center at 1005 N. Voyager Dr. Gilbert, AZ 85234, with visitation at 9:00am. A second service will be held in St. Johns, Arizona at 2:00pm,, Saturday December 29, with visitation beginning one-hour prior, at the downtown LDS chapel.